It is a natural process that a buried steel tank will rust and one day develop a hole and oil will leak from the tank. How long it takes a tank to leak is based on many different factors such as age of the tank, moisture content of the soils, thickness of the tank, geology of where the tank is buried, ect. The important question to answer regarding oil tank leaks is how big a problem exists. The first step in cleaning up a tank leak is to define the extent of the leak. Unfortunately you cannot accurately guess how bad a tank leak is from looking at the ground. Like determining a cancer diagnosis with biopsy sample, underground soil testing needs to be performed to determine how deep and how far the oil has spread. 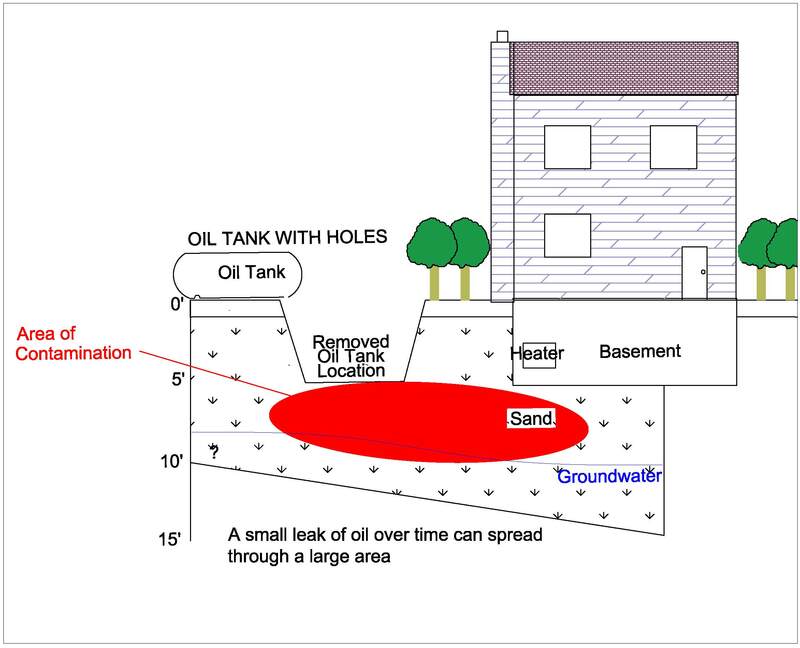 This diagnosis of the area of oil contamination is called delineation. You determine the extent of an oil tank leak by performing test borings both in and surrounding a tank leak. The borings are drilled into the ground to both physically evaluate soils for the presence of petroleum as well as to test soils for oil concentrations (yes there are legal amount of oil that can remain in the ground). The number of test borings required to define the extent of contamination is based on how far the oil has spread. Simple put the bigger the problem the greater the number of time and borings, the smaller the problem lesser the time and number of borings. The cost to cleanup an oil tank leak is based on how much soil and groundwater has been contaminated. Guessing the number of tons of impacted soil is just a guessing. The tank that leaked in this photo leaked for a long time and the formation was very sandy with a high groundwater table allowing the oil to pancake or spread. 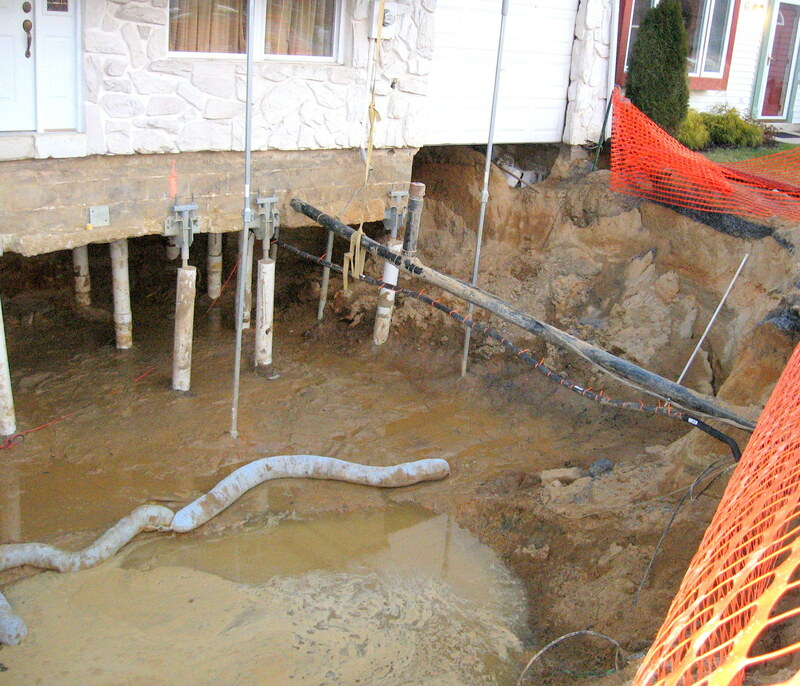 The foundation of any remediation project is knowing where and how much to dig. Knowing the extent of the plume allows you to efficiently cleanup an oil tank leak by knowing how much soil will need to be addressed. The tank leak in this photo was a minor leak soils were tight and cleanup was finished in one day for slightly less that $8,000.00. A lot of money, but not as bad as the prior tank photo. Each tank leak is unique. Delineation (obtaining soil samples from the are of the leak to determine the size of the leak) is accomplished by using ATV mounted drilling equipment. The delineation acquires soil sampling to determine the horizontal and vertical size of the area of contamination. Geoprobe ATV Drilling Unit, this compact drilling unit is 41" wide allowing access to hard to reach locations. 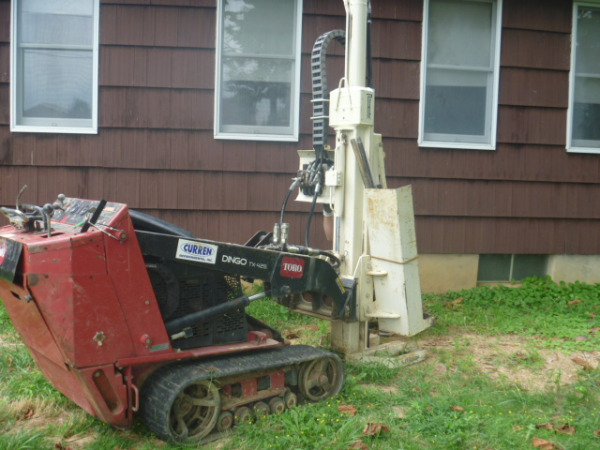 With a drilling depth of 25'+ the unit can tackle jobs big and small. Once the area (size length and width) of the contamination is determined an estimate can be developed to remediate the problem. 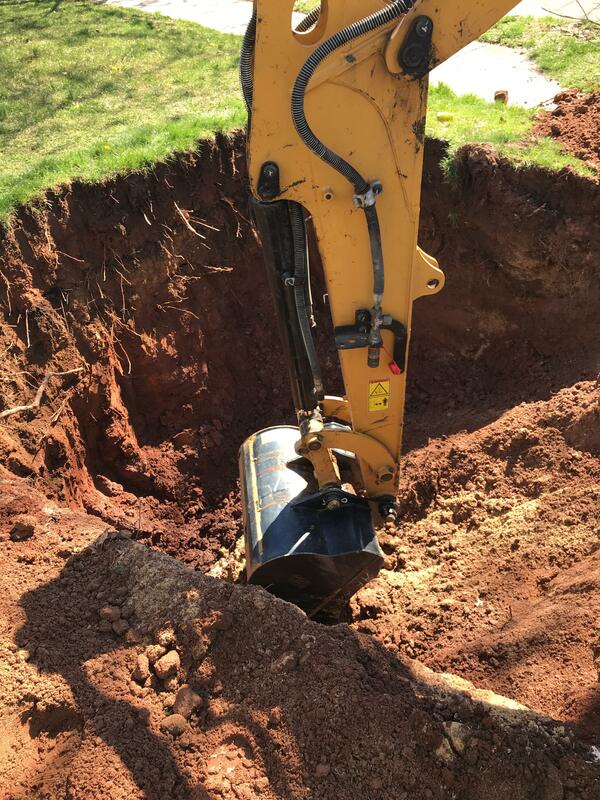 Knowing where the extent of the contamination is below ground can assure you that the proper personnel and right sized equipment is brought to your site to remediate the contamination. Curren uses all in house personnel and equipment which ensures a cost effective project as middlemen and subcontractor costs are eliminated. 20 years of experience provides our clients with the confidence that remediation is performed professionally and according to environmental regulations. 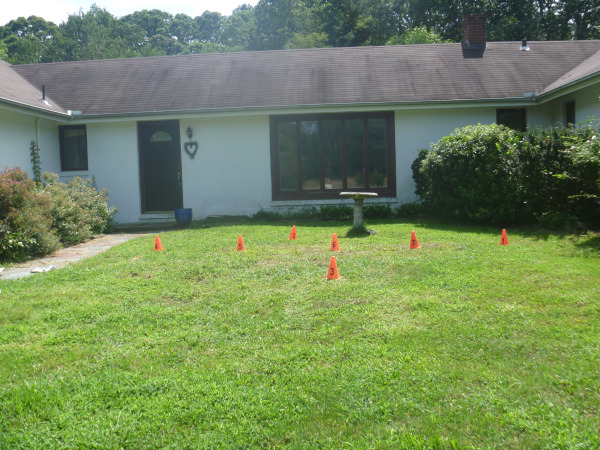 Certified for oil tank remediation in New Jersey (NJDEP), Pennsylvania (PADEP) and Delaware (DNREC). We provide a no cost obligation to discuss the specifics of your project and answer any questions you may have, either by phone or in person. Being a full service turnkey environmental company provides Curren Environmental cost advantages other companies just can't beat. Curren will review a competitors estimate and match or beat their costs, guaranteed.